Hotel Panama Garden is the most conveniently located hotel in Central Rome most convenient to the Circonvallazione and the GRA (Grande Raccordo Anulare) highway ring roads, (5 km from the hotel) main thruways to all of Rome. 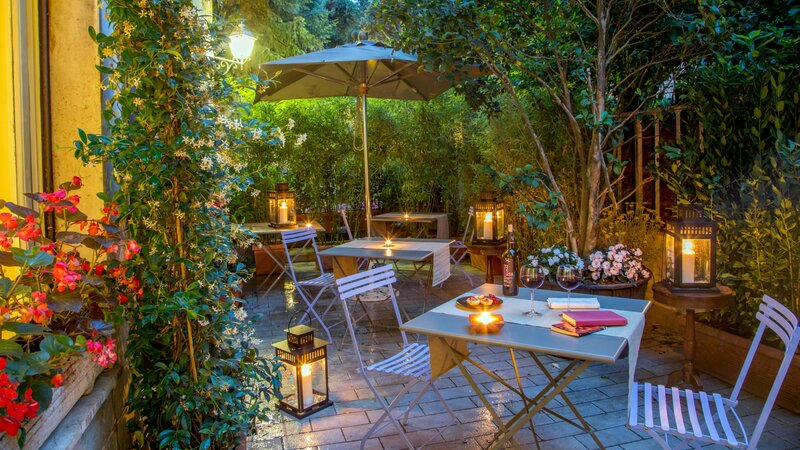 Located in the Parioli quarter, the most elegant of the city, the Panama Garden is across the street from Villa Ada and its magnificent park.Within walking distance of the Hotel Panama Garden, is the second urban park of Rome after that of Villa Doria Pamphili. Once the residence of the Savoy royalty, Villa Ada is known for its own magnificent park, which can be visited from dawn to dusk. It is home to ancient trees and a delightful little lake along with equipped exercise circuits, jogging, trails, and stables. In summer, it is the setting for musical events and theatrical performances. Nearing Rome from the highways, enter the Grande Raccordo Anulare (GRA). Take exit 8 Salario / Parioli / Aeroporto dell'Urbe and follow the signs to via Salaria / Centro. Continue straight along via Salaria for 5 kilometers to number 336, where you will find Hotel Panama Garden. - with the "Leonardo Express" train which will take you to Termini station in 30 minutes. All Intercity and Eurostar trains from major Italian cities (Milan, Naples, Venice and Florence) arrive and depart from Termini, Rome's main train station. In front of Termini station, in Piazza dei Cinquecento, take bus 92 toward Marmorale and get off after 10 stops in via Sebino, at the corner of via Taro; Hotel Panama Garden is 400 meters away. Go to the end of via Taro, turn right on via Salaria, go 100 meters and you have arrived.